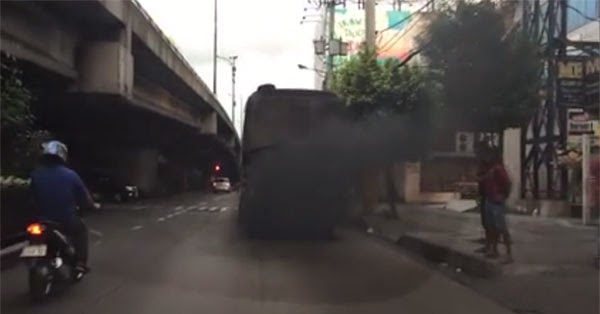 "They still allow this on Edsa" is the caption of a video posted by actor Epy Quizon that shows a smoke-belching bus plying the EDSA route. The actor-comedian did not specify anyone but was apparently referring to the Land Transportation Office (LTO) which has the authority to apprehend smoke-belching vehicles on the road. A conversation between Quizon, son of the late "Comedy King" Dolphy, and his companions is audible in the footage. They were discussing about how clean the passenger bus is on the side but its back is black. The smoke-belching bus with license plate number "TXY 517" belongs to Mannrose Liner, the same company of the passenger bus that caught fire and burned while on the north-bound lane of the EDSA-Ayala Avenue area, approaching Buendia, in Makati City, in January 21 this year. Republic Act 8749, also known as the "Clean Air Act of the Philippines," states that "smoke belching vehicles on the road shall be subjected to emission testing by properly equipped enforcement teams from the DOTC/LTO or its duly deputized agents." Third offense- P5,000 plus seminar on pollution. Sadly, it seems this law has not been properly and consistently implemented.